Working as I do in the book business, one can sometimes feel overwhelmed by the quantity of literature that gets published. And the sheer quantity can dilute the impact of a really good book – because another one will be along next month. So that is why I want to say: forget the rest, just get the best. And Randy Alcorn’s book is the unrivalled best on its topic. You will save a lot of time by sticking to Alcorn’s book (for he summarises most of the arguments of the other writers) and reading it, rereading it, and mastering it. Time very well spent.Of course, I mean the ‘forget the rest’ rhetorically. We’re all much the richer for reading David Alton’s brilliantly-presented magazine-like Life After Death; Jack Scarisbrick’s hard-hitting Let There Be Life, or Ann Farmer’s The Language of Life. Alcorn himself has written a shorter book called Why ProLife? Then there are the stories of the campaigners: Raymond Dennehy’s Anti-abortionist At Large, Ruth Pakaluk’s The Appalling Strangeness of the Mercy Of God, Frank Pavone’s Ending Abortion, and Recall Abortion by his EWTN / Priests For Life coworker Janet Morano. But all of these are potboilers by comparison with Alcorn’s systematic treatment. 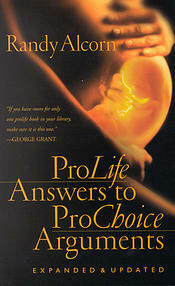 George Grant writes: ‘If you have room for only one prolife book in your library, make sure it is this one.’. Gregg Cunningham (and he should know) puts it in a class by itself. The book’s approach is similar to that taken by Cunningham and by Stephanie Gray: ruthlessly logical and scientific, always putting the ball in the opponents’ court, though winning hands-down when it comes to compassion as well. ‘Religion’ does not get a look-in, and nor should it, for we are dealing with reality, not religion. And that makes the debating playing-field level: we don’t have to worry about issues of biblical authority. The logic of the situation is sufficient. Abortion protests itself. Alcorn’s book consists of 219 arguments in favour of his position (considerably more than one has ever heard from the other side), which he then unpacks and expands upon, with excellent use of statistics and quotation. However, his arguments are not merely (merely? Hark at me! )arguments in favour of the child living rather than dying. Every single one of them is in the context of a pro-‘choice’ claim, and responds directly to that claim. Therefore he always holds in his purview both mother and child, and therefore is always speaking about the overall situation, rather than cherry-picking from it. This makes his arguments generally superior to those of people who mention only the mother (or indeed only the child – albeit, of course, the child has a great deal more to lose). You know the saying ‘All roads lead to Rome’. When there can be 219 arguments in favour of any position at all, that is a pretty remarkable thing. Surely, therefore, that position must be right. Equally, when there are 219 arguments against a position, ought we to wait till there are 500 before pronouncing that position unequivocally wrong? One of the reasons it can be so difficult to debate on this issue is that opponents can make ten errors in a single sentence. One does not know where to start in responding! All the more gratitude is therefore owed to Alcorn for setting his book out so systematically, so that all the pro-‘choice’ claims are treated separately, and each is responded to in several different ways. In October 2008, when the Commons were voting on the abortion time-limit, I emailed all 350 pro-‘choice’ MPs with an expanded version of Alcorn’s arguments, increasing his 219 to 301. (By the way, Alcorn actively encourages such use of his work without requiring royalties.) The result? 15 substantive points in total were made by MPs in reply. Not one of these 15 addressed any of the 301 points. In May 2012 I handed this out at a supposedly ‘open’ Commons committee-room meeting. Zoe Williams said she already knew what my arguments were, to which the only possible response was given: ‘What? All 301 of them?’. Be that as it may, neither she nor anyone else in attendance has (over 12 months later) addressed a single one of them. Those who cannot debate at all (or say that they can but do not in fact do so, rather like Molesworth answering an exam question ‘larfably easy’) rank below even those who can debate but still lose. How can we rest while so many of our rulers, movers and shakers are in this worst and lowest category? So why is it so hard to convert people? Well, it isn’t necessarily. Abort67 and 40 Days For Life are doing a great job. But otherwise why? First, because the present status quo is so convenient to their lifestyle. Second, because they are not using rational argument at all even when they are capable of doing do. This is why, when debating on abortion, we should insist on being able to cross-question opponents and vice-versa. Otherwise, there will be the same old story. Each side will give an extended presentation from their own point of view. Answers and refutations given in the past will be ignored as the same points are made and re-made. The talk will be general and vague rather than specific. That is the situation we should reject. If we follow through every argument with our opponents, with the doughty help of Alcorn, not allowing (according to the rules of debate) any change of subject, their position has not a leg to stand on.